Liberty's new 2,515 square-foot customer service center in Plaza del Sol. Liberty’s new 2,515 square-foot customer service center in Plaza del Sol. Liberty Puerto Rico inaugurated Thursday its new Customer Service Center at Plaza del Sol Shopping Center in Bayamón to provide more convenience and efficiency to customers in the Bayamón area, the company announced. The new center has 2,515 square feet of floor space and offers a modern and comfortable area with several technological advances that allow customers to complete their transactions more efficiently. “Besides having a better location, this center offers more convenience to customers in this area and allows us to handle a larger volume of customers, thanks to an extended work schedule and our technological advances,” said Elizabeth Sánchez, senior service center manager at Liberty Puerto Rico. “At Liberty we continue to make improvements in all of our centers that allow our customers to do more in less time while they discover new products that can improve their customer experience even more,” said Naji Khoury, president of Liberty Puerto Rico. 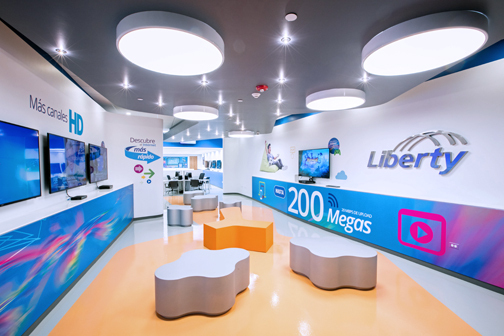 Just like Liberty’s Customer Service Center in Hato Rey, the Plaza del Sol offers a full array of services and comprises a demo area where customers can sample some of the provider’s products. This center’s opening also responds to a growing number of new homes that Liberty is adding to its coverage area in Bayamón and surrounding municipalities. Between 2015 and this year so far, Liberty has added 4,412 new homes in Bayamón, while another 79 will be completed by year’s end. Liberty is currently adding 2,159 new homes to its coverage area in the neighboring municipalities of Toa Alta, Toa Baja and Dorado. Que horario tienen ustedes en la tienda de servicio en Plaza Del Sol? Lo más importante es el horario de la tienda, la cantidad de empleados atendiendo a clientes, si abren los domingos, el número de teléfono para los clientes comunicarse, la dirección y en caso de centros comerciales su ubicación. Lo demás es solo cosmético. Hola, estoy intentando comunicarme desde hace semanas con ustedes pero el sistema telefónico parece no estar funcionando, necesito hacer un cambio de dirección, a donde puedo ir o comunicarme para ello? Hey Buddy!, I found this information for you: "Liberty opens new Plaza del Sol customer service center". Here is the website link: https://newsismybusiness.com/liberty-customer-service/. Thank you.